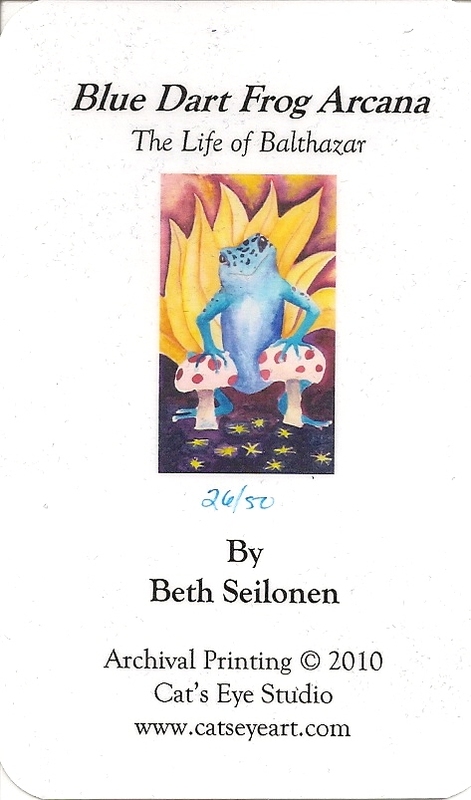 "Blue Dart Frog Arcana: The Life of Balthazar" is a signed and numbered edition of 50, my copy is number 26. The laminated cards measure 2.75 by 4 inches (6,4 cm x 10,2 cm) and have curved corners. The deck came with an interpretation card and a title card. The backs are reversible. 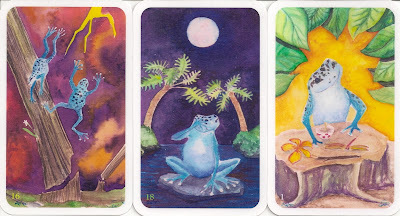 Each card has the deck number in its lower left corner. Though the cards themselves have only numbers and no titles,one can tell from the art that 8 is Strength and 11 is Justice. The deck is tucked into a blue velour bag which is nestled into a white card box with a hand drawn image on it.